It’s hard to believe I’m in the tenth month of my giving pledge. 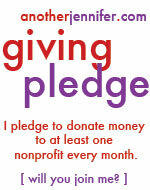 I am so glad that I decided to make a pledge to donate to at least one nonprofit each month. It truly has made me think more about my own giving habits. This month, I donated to SenseAbility Gym. You may remember Alysia’s guest post for Philanthropy Friday at the end of September. I love what Alysia is doing. I love that it’s in my hometown of Hopedale, MA. I love that it will benefit both kids and parents who deserve a comfortable place to gather for play and support. I’m proud that I can help a bit to get it opened. Have I mentioned yet how easy it is to make these donations? Did you give this month? I remember you doing a post about this, and being really impressed by what they’re doing. Generally speaking of giving donations…. It looks like a lot of us are going to need to follow your lead Jennifer and step up and help with this devastating storm damage along the east coast. jen recently posted..you’re welcome, jerk! A donation to the Red Cross would definitely help right now. We were lucky that we weren’t hit too hard in Maine, but there are some very devastated areas south of us. Thank you SO much!! This means so much to our community and to me personally. Can’t wait for you to come check us out! You’re welcome. Alysia. I can’t wait to check out the gym either! That’s wonderful that you donate every month to the children’s hospital. That must be a very meaningful donation for you. Do you have a link to your donation page?